I discovered this fruit by chance, two years ago, on a Hanoï market, during a travel to Vietnam. I didn't even know that it was a cactus fruit. Since that time I have learned that it's the fruit of "Hylocereus undatus", a "semiepiphytic" cactus, native to Central America and widespread everywhere in the intertropical zone of the world. This plant isn't an epiphytic plant in the strict sense of the word. It climbs on tree trunks, its roots are terrestrial and it draws its food from the soil. Thus, Hylocereus undatus is more precisely a climbing cactus. 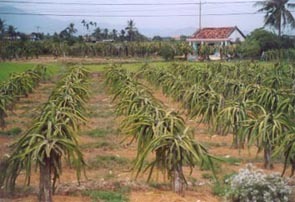 Vietnamese people chose the name: "Thanh Long " or "Dragon Fruit" in reference to the plant which produces it, which climbs on tree trunks, and whose interlaced stems evoke the sinuous shape of a dragon's body, mythological animal very popular everywhere in Asia, especially in China and around. 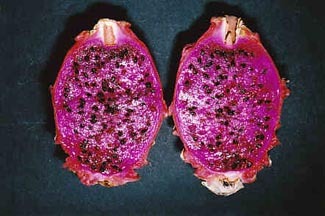 The same fruit is known in America under the names of "Pitahaya" or "Pitaya". The plant has been grown for its fruit, for more than one hundred years. Currently, in Vietnam, it's grown on a large scale, specially between Mui Ne and Saigon. Initially, farmers drive tree trunks and more recently brick and concrete piles into the field soil. These piles are about one to one and a half meter high. The plants climb on these supports, then fall down, allowing easy harvesting of the fruits, which often grow near the end of the stems. This fruit is enormous. To my knowledge, it is the biggest in all edible cacti fruits, much bigger than the prickly pear, fruit of the terrestrial cactus Opuntia ficus-indica. The sample photographed above, which isn't at all exceptional and that I bought on a market in Saigon, is more than 15 cm long and weighs 1 Kg . 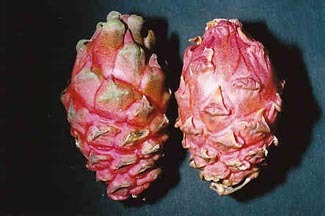 The inner part of the fruit is filled with a very juicy, and a sweet- tasted whitish or reddish pulp. It's very refreshing, especially when it has been kept for a little while in the fridge. 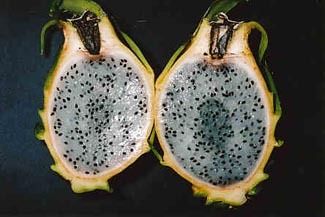 In the pulp you can observe several thousands of small black seeds. Pulp is also used to prepare sorbets, and the flower buds, which are enormous, too, are consumed as vegetables (Alas, I don't know the recipe…). 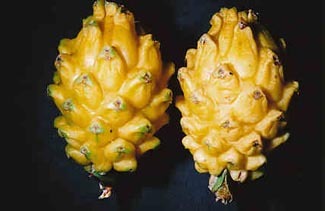 Currently, exports of this fruit to Europe are common, as well as the mass culture in foreign countries. 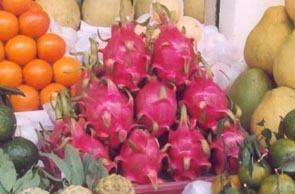 It's easily possible to buy the Dragon Fruit in some Paris stores, especially in Chinatown. 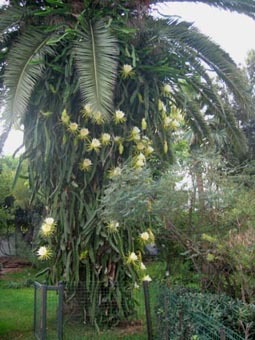 Hylocereus undatus, growing on a palm tree trunk, in Morocco. Etymologically, Hylocereus means "forest columnar cactus" since the word comes from the Greek "hulos" : forest, and from Latin "cereus" : candle. As I already wrote earlier, Hylocereus undatus, native to Mexico and to the South-West of the United States, grows everywhere in the world, in the intertropical belt. It's also found, in a less abundant way, in the Mediterranean area, particularly in North Africa. I observed one of them a few days ago at the Monaco Exotic Garden ; it had beautiful fruit. The above photo is one that my website’s readers very pleasantly allowed me to use. It shows a splendid subject, climbing on a Moroccan palm tree trunk. It also bears fruit. 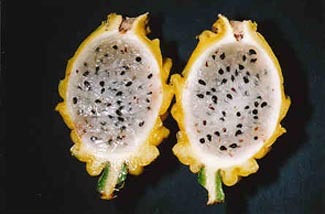 A close species, Hylocereus purpusii, produces a fruit with identical aspect, but whose pulp has a wine-red colour. 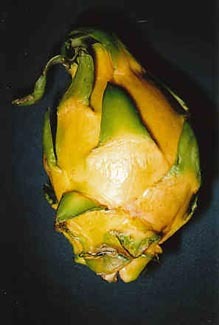 Selenicereus megalanthus, also produces a fruit whose shape is close to those of the previous ones, but its size is a little bit smaller, and the color of skin and pulp is yellow. It occurs especially in Colombia. 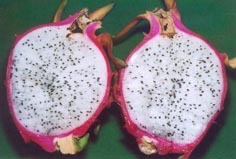 The Dragon Fruit is commonly consumed in the Caribbean islands and in Central and South America under the name of "Pitahaya", in the Reunion Island under the name of "Raquette tortue" (word for word : "stem tortoise" ; tortoises like to eat Hylocereus stems), and of course in Asia. It is grown on a large scale for export , mainly in Vietnam, Thailand, and Israel. The white pulp variety is the easiest one to find in Europe ; the red or yellow pulp varieties are less common. The culture is done by making the plants climb around piles as indicated above, but also along vertical nettings. Blossoming of flowers (enormous flowers, up to 35 cm long and 25 cm in diameter !!) last only one night, and the fruit is ready to be harvested approximately one month later. 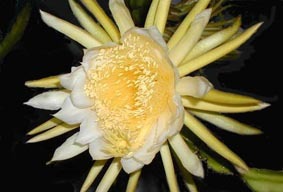 If the pollination of Hylocereus is made naturally by bats or hawkmoths in America, elsewhere it is necessary to resort to manual pollination, using two different clones from one species, or two different species ; (Hylocereus undatus and Hylocereus purpusii for example). 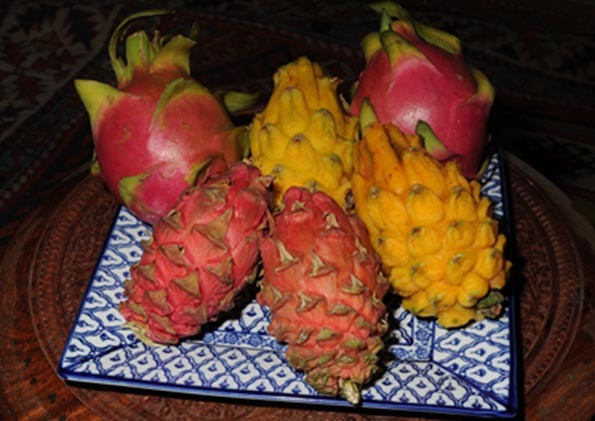 The Dragon Fruit, almost unknown in Europe ten years ago, is increasingly present, especially at the approach of Christmas and New Year (French New Year but also Asian New Year), in the exotic fruit department of supermarkets and specialized fruit stores. It may be consumed without any processing, using a dessert spoon, chilled and without anything on it, or drizzled with a dash of lime juice, if you don't like its sweet taste. It's also possible to use the fruit to make delicious sorbets. 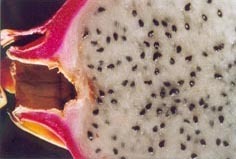 Moreover, the Dragon Fruit contains vitamin C, and is a high-fibre and high-mineral salt fruit. It is said to have laxative and stimulating properties. I tried it and I find it delicious and very refreshing. 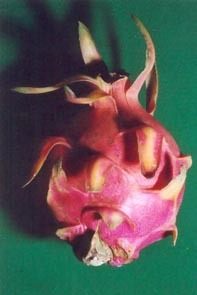 This is the fruit of Hylocereus megalanthus (formerly Selenicereus megalanthus). It's flesh has a very fruity taste. The spines of the fruits were cut before the sale. This fruit, with red flesh and very fruited tasted too, is the fruit of an hibrid Hylocereus which name I don't know. I don't know either the name of the hybrid Hylocereus which gives this fruit. One more cactus is very popular in Asia and more particularly in Vietnam where a legend about it is very widespread : it's Epiphyllum oxypetalum. The legend is the subject of my page : a Vietnamese legend.